I often hear that chefs hate Valentine's Day. I'm not sure why, their restaurants are most likely to be full. Perhaps it is the view: staring out from their open kitchens across a sea of couples; or it might be all that furniture reshuffling as their share-plate-driven tables for eight need to be rejigged as a plethora of pairs. It's likely the expectations; that on this night the food must be extra special, the most sparkly, wondrous experience all the while tightass Dave is asking for a "V day Deal" as he hands over the credit card. All of this points to the benefits of a homemade meal: no other nauseating couples, no rushed eating to facilitate the double-booked tables, and complete control over the menu. Here are four sweets to help you create a sense of occasion, all of which can be prepared ahead. If you love a good thick layer of caramel, double the caramel ingredient quantities, you won't be disappointed. This slice has serious fridge staying power, it keeps well for up to one week. 1. For the base line a 2-cup capacity terrine or square baking tin with baking paper or plastic wrap. 2. In a food processor, whiz the biscuits into coarse crumbs. Add the melted butter and blitz briefly to combine. Press into the base of the lined tin, cover and place in the fridge while preparing the other elements. 3. For the caramel melt the sugar in a saucepan over medium high heat, gently swirling the pan, for five minutes or until a light, golden caramel forms. Add butter and swirl pan, then add the cream, swirling continuously to combine (be careful as mixture will spit). Remove from heat, stir in the softened gelatin sheets, add the chopped cashews and pour the caramel evenly over the shortbread base. Place in the fridge for 30 minutes. 4. For the ganache place the dark chocolate in a bowl. In a heavy-based saucepan, bring the cream and glucose syrup to a simmer over medium heat, then pour over the chocolate, stirring until melted and smooth. Pour the ganache over the caramel layer. Cover and chill for 4 hours or until set. 5. For the glaze place the milk chocolate and oil in a heatproof bowl set over a pan of simmering water, and stir until melted and smooth. While you allow the chocolate to cool slightly, carefully remove the tart from the tin. Gently pour the melted chocolate over the ganache layer, letting it drip down the sides, before smoothing the surface with a palette knife. Chill for 30 minutes to set. 6. To serve, dust the slab with cocoa powder and slice using a hot, sharp knife. Use 5cm-8cm biscuits or pastry rounds. Leftover wagon wheels will keep in the fridge in a tightly sealed container for about 2 weeks. 1. To make the gluten-free cookies line a baking tray with baking paper. 2. Beat the butter, then cream it with the sugars and vanilla paste until light and fluffy. Stir in the flour and baking powder and mix together to form a dough. 3. Form the dough into about 20 balls, arrange on the baking tray ensuring a few centimetres gap between each, then press each ball flat with the flat edge of a knife (the cookies should be between ½- to one-centimetre thick). Chill in the fridge for 15 minutes. 4. Preheat oven to 190C then bake the cookies for 12 minutes or until light and golden. Remove from heat and allow to cool completely on the baking tray. 5. For the marshmallow add the eggwhites and rosewater to the bowl of an electric stand mixer fitted with the whisk attachment and mix on low speed. 6. Add 75ml water, the castor sugar and glucose to a small saucepan over medium heat. Stir gently to dissolve the sugar, then bring to the boil. Boil until the syrup reaches 125C on a sugar thermometer, then remove from heat. 7. Increase the stand mixer speed to medium. Slowly pour the sugar syrup down one side into the mixing bowl, being careful not to let it touch the moving whisk. 8. Melt the bloomed gelatine sheets (not the iced water) in the still-hot saucepan then quickly add the gelatin liquid to the eggwhite mixture. Continue whisking until the eggwhite mixture cools to about room temperature. 10. Leave the sandwiched biscuits at room temperature for a few hours to set. 11. When ready to dip the biscuits, place a wire cooling rack over a sheet of baking paper to catch the drips. 12. Melt the chocolate and pour into a wide bowl. Using a spatula gently dip a biscuit into the chocolate, shake off excess chocolate, then place on prepared rack. 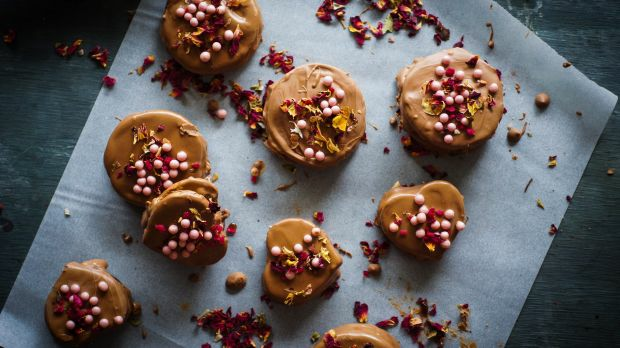 Sprinkle with dried rose petals and Crispearls, if using. Repeat with remaining wagon wheels. 13. Leave to set for 30 minutes at room temperature then pop in the fridge for five minutes to set completely. Note: Pour any leftover marshmallow mixture into a lined, high-sided baking tin and leave for four hours or until set. Dust with icing sugar before cutting into squares, to prevent your knife becoming a gloopy mess. This makes a big slab of delectable goodness to be enjoyed on a single plate with 2 spoons (leftovers will keep in the freezer for one month). Liquid glucose can be replaced with about 1 cup castor sugar. Available from most supermarkets, liquid glucose is great for a smoother, less icy consistency. 1. Whisk the cream until stiff peaks form. 2. In a separate bowl, add the eggs, yolks, glucose syrup, cardamom and vanilla and place over a saucepan of simmering water. Whisk continuously until the mixture is thick and glossy and coats the back of a wooden spoon. Stir through the ground pistachio. 3. Gently fold the whipped cream through the egg mixture until just combined. 4. Pour half the mixture into a 2½- to 3-cup capacity freezer-proof container or loaf pan then place in the freezer for 40 minutes. Cover the remaining semifreddo mixture and place in the fridge. 5. Using a hot wet knife, cut the bar of nougat into long, thin lengths. It is important to make these quite thin because when the nougat layer is difficult to cut through when frozen. 6. 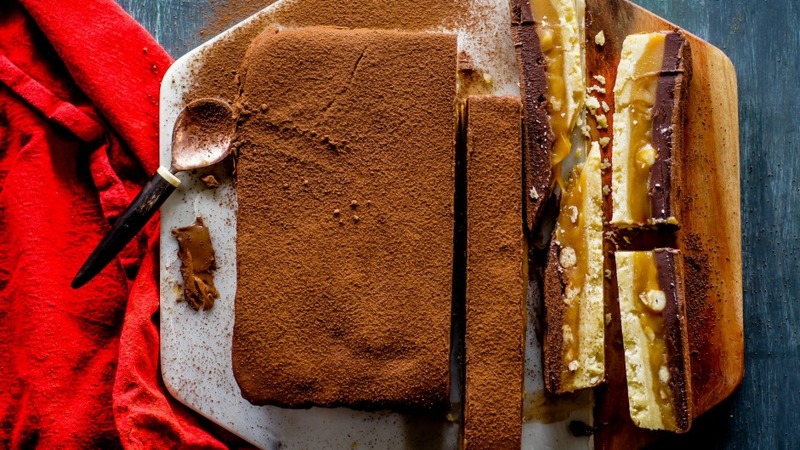 Remove the semifreddo from the freezer and gently cover with a layer of nougat pieces. Reserve any leftover nougat for decoration. 7. Carefully pour over the remaining semifreddo mixture from the fridge, then cover and return to the freezer for five hours or until set. 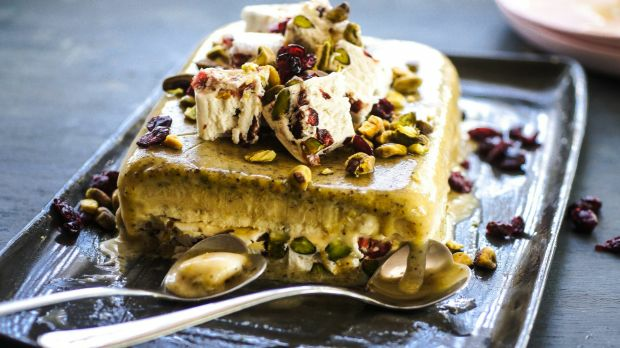 To serve, turn out the semifreddo onto a serving platter and top with the remaining nougat, chopped pistachios and dried cranberries. If the Weis bar and your favourite summer holiday had a love child, this vegan-friendly dessert would be it: light, fresh, tropical and delicious. Leftover granita will keep in the freezer for two months. Tip: It helps to run the fork through each granita mixture a few times (ideally every two hours) to ensure maximum, icy goodness. 1. For the raspberry granita add the raspberries, orange juice and vanilla bean paste to a blender and blitz until smooth. Add a little more orange juice if the mix seems overly pulpy. 2. Pour into a wide, shallow container, cover and freeze for six hours or overnight. 4. For the mango granita first make a syrup: add the castor sugar, kaffir lime leaves and water to a saucepan and place over medium-high heat. Bring to a boil, stirring regularly, until the sugar has dissolved. Remove from heat and set aside for about an hour to allow the flavours to infuse. 5. Strain the syrup into a blender, add the mango flesh and blitz until smooth. 6. Pour into a wide, shallow container, cover and freeze for six hours, preferably overnight. Scrape into crystals with a fork then return to freezer. 7. To serve, spoon the coconut yoghurt into bowls. 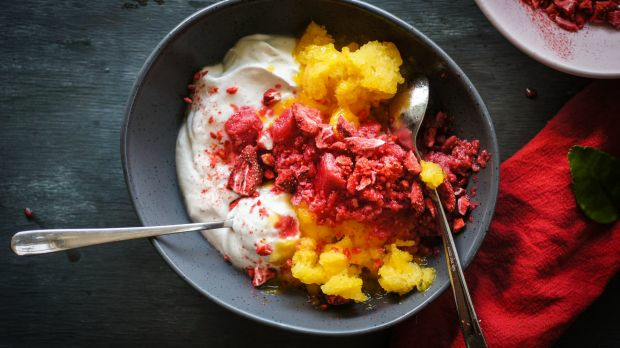 Scrape over raspberry granita then mango granita, sprinkle with freeze-dried fruit (if using) and serve immediately.